Jun 26, 2015 Omega XL contains PCSO-524, the patented marine oil sourced from the green lipped mussel that is harvested over an 18 month life cycle in the pristine waters of New Zealand. Nearly 40 years of scientific research, including peer-reviewed published studies, have been conducted on PCSO-524 demonstrating that it provides support for relieving pain. I just watched this on TV and laughed. It is sad that they are taking away from people that probably can't afford it. 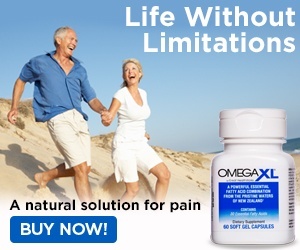 If you want something that works for cronic pain there are many supplements much better. Corydalis 2000mg per serving 10:1 works really well for me. You can order from Amazon; Great for low back and headaches... I get my Omegas from food sources, the grass fed beef I use it 3-1 (3 omega 6's for every Omega 3) the average grain fed beef is 16-1 not good. Eliminate Gluten, grains and dairy for as little as two weeks and you will be amazed. People looking for the magic pill, there isn't one. There are great supplements out there but there are also a lot of garbage. Keep in mind that supplements are just what they say supplements. The food you put into your body daily is important. Reason of review: Deceitful advertising. Review #611711 is a subjective opinion of User611711.